In this tutorial, you’ll learn how to build an iOS framework so you can share code between apps, modularize your code, or distribute it as a third-party library. 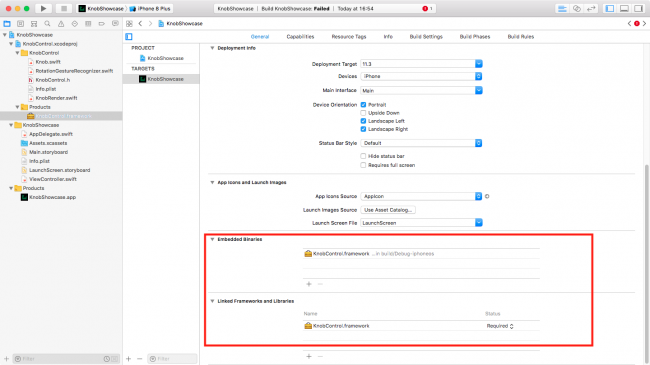 Update note: This tutorial was updated to iOS 12, Xcode 10, and Swift 4.2 by Lorenzo Boaro. The original tutorial was written by Sam Davies. 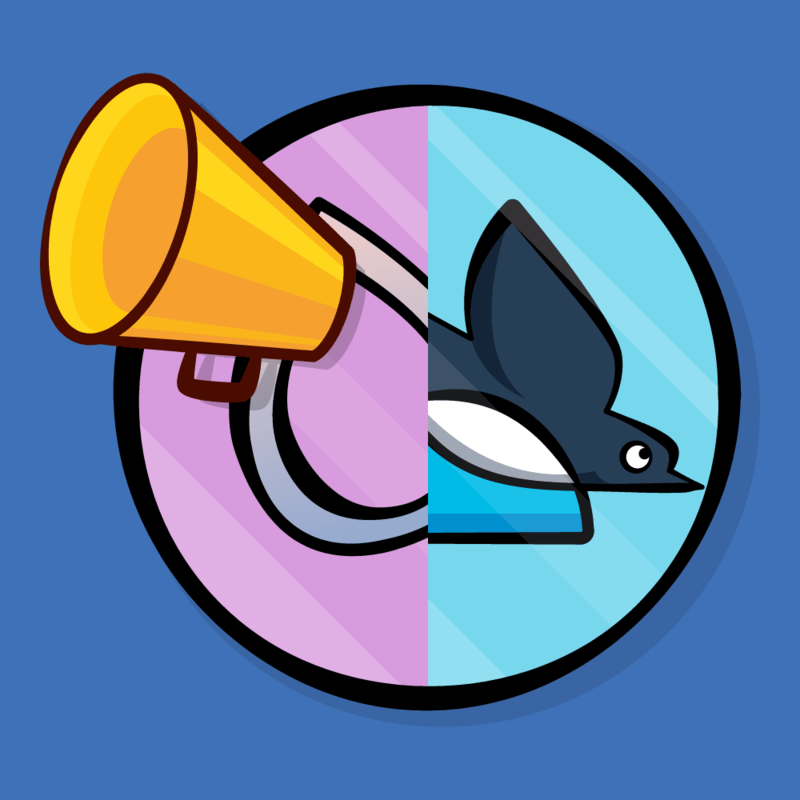 Have you ever wanted to share a chunk of code between two or more of your apps, or wanted to share a part of your program with other developers? Maybe you wanted to modularize your code in a manner similar to how the iOS SDK separates its API by functionality. Or perhaps you want to distribute your code in the same way as popular 3rd party libraries. In this tutorial you’ll learn how to do all of the above with Frameworks! In Swift parlance, a module is a compiled group of code that is distributed together. A framework is one type of module, and an app is another example. Creating a new framework for the knob control. Importing the whole thing back into the app. 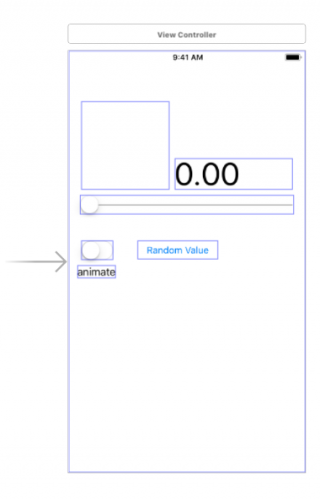 Rendering your custom component on the fly in Interface Builder. Packing it up as an uber-portable CocoaPod. Bonus: Setting up a repository for your framework. Use the Download Materials button at the top or bottom of this tutorial to download the projects and open the starter project in Xcode. KnobShowcase is a simple application that demonstrates how to interact with a control like a circular slider, such as those found on a mixer. Build and run to get an idea of how it works. Knob.swift has all the view logic. 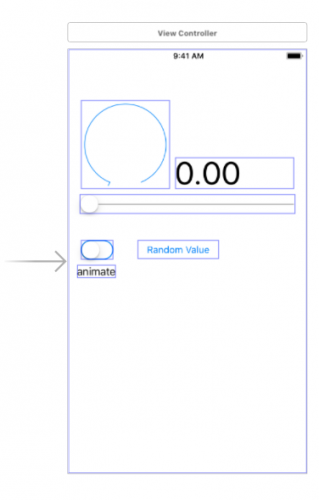 ViewController.swift is responsible for creating the knob and interacting with it. The knob control is pretty sweet. Wouldn’t it be nice to use it in a number of applications beyond this fun, but completely silly, app? Frameworks to the rescue! Frameworks are self-contained, reusable chunks of code and resources that you can import into any number of apps and even share across iOS, tvOS, watchOS, and macOS apps. If you’ve programmed in other languages, you may have heard of node modules, packages, gems or jars. Frameworks are the Xcode version of these. Some examples of common frameworks in the iOS SDK are Foundation, UIKit, AVFoundation and CloudKit. Note: If you want to learn more about Frameworks, read What are Frameworks?. In Xcode 6, Apple introduced the Cocoa Touch Framework template along with access control, so creating frameworks has never been easier. The first thing to do is to create the project for the framework. 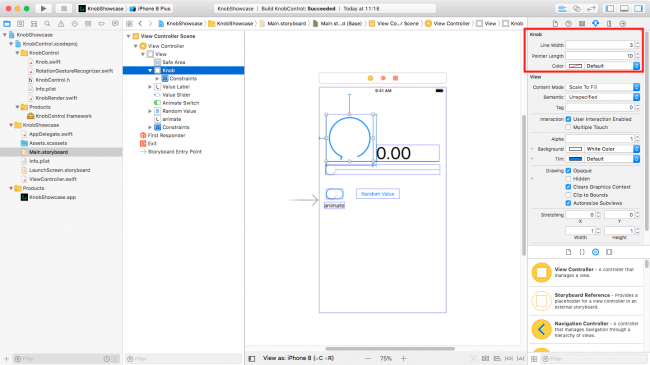 In Xcode, select File ▸ New ▸ Project…. Choose iOS ▸ Framework & Library ▸ Cocoa Touch Framework. Set the Product Name to KnobControl. Use your own Organization Name and Organization Identifier. 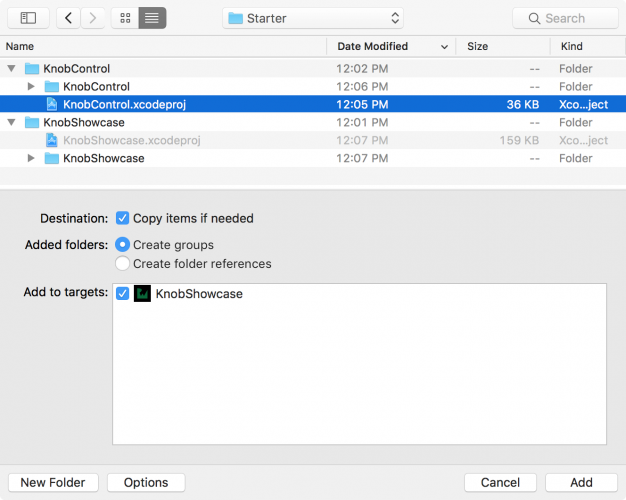 In the file chooser, choose to create the project at the same level as the KnobShowcase root folder. Now you have a project (albeit a boring one) that creates a framework! Your current state is a framework without code, and that is about as appealing as straight chocolate without sugar. In this section, you’ll introduce code by adding the existing files to the framework. 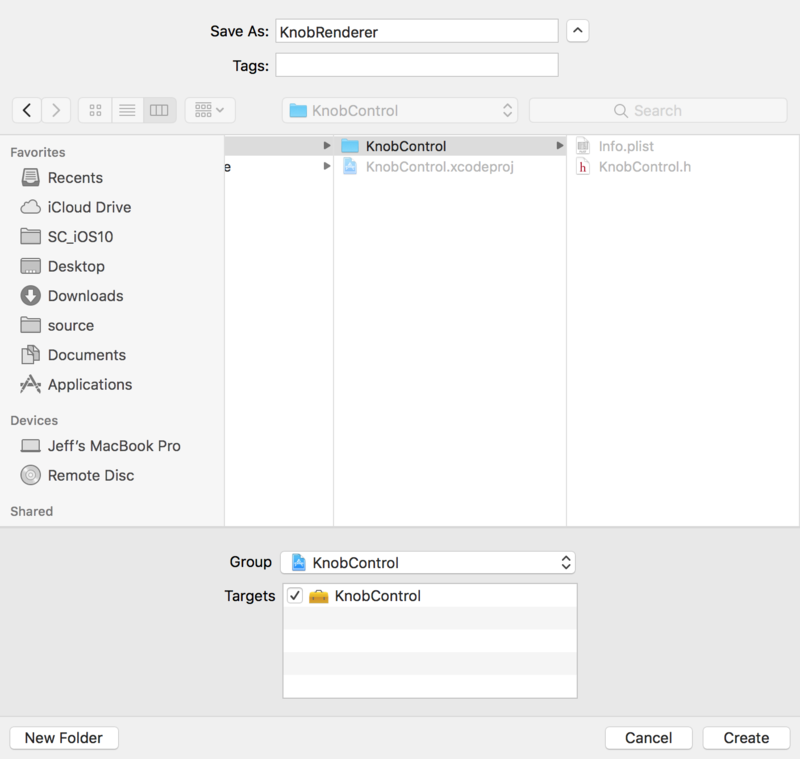 From the KnobShowcase source directory, drag the Knob.swift file into the KnobControl project in Xcode. Make sure to check Copy items if needed so that the files actually copy into the new project instead of just adding a reference. Frameworks need their own code, not references, to be independent. Double-check that Knob.swift has Target Membership in KnobControl to make sure it appears in the final framework. You can verify this in the File inspector. Knob: the actual custom control. KnobRenderer: a private class that keeps track of the code associated with rendering the knob itself. RotationGestureRecognizer: a private class that enables the interaction with the knob. Go to File ▸ New ▸ File… and select iOS ▸ Source ▸ Swift File. On the next screen, specify the class name as KnobRenderer and choose the KnobControl ▸ KnobControl directory. Open Knob.swift, cut (Command-X) the entire KnobRenderer class and paste it (Command-V) into KnobRenderer.swift just below the import Foundation statement. Remove the private modifier for KnobRenderer. When the code was all contained in Knob.swift this was fine, but now it must be accessible throughout the module with the default internal modifier. Repeat steps 1 to 6 for the RotationGestureRecognizer class. In this case, when you perform the fifth step, make sure you also grab the import UIKit.UIGestureRecognizerSubclass statement, otherwise the compiler will complain during the build phase. 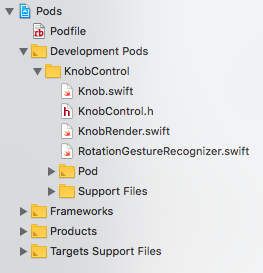 With your two new files created, Knob.swift now only contains the Knob class. Note: Separating classes into their own files is not strictly necessary, but it’s a good practice in order to make your code organized. You don’t want to have a huge file that is hard to comprehend and maintain. Close the KnobControl project, and go back to the KnobShowcase project. Delete Knob.swift file. Select Move to Trash in the confirmation dialog. 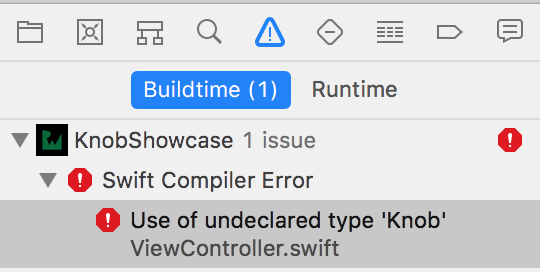 Build the project, and you’ll see several predictable errors where Xcode complains about not knowing what the heck a Knob is. Well, you’ll actually see Use of undeclared type ‘Knob’ error message. Adding the KnobControl framework project is the solution to these problems. Right-click on the root KnobShowcase node in the project navigator. Click Add Files to “KnobShowcase”. In the file chooser, navigate to and select KnobControl.xcodeproj. Click Add to add KnobControl.xcodeproj as a sub-project. Note: It isn’t strictly necessary to add the framework project to the app project; you could just add the KnobControl.framework output. However, combining the projects makes it easier to develop both the framework and app simultaneously. Any changes you make to the framework project are automatically propagated up to the app. It also makes it easier for Xcode to resolve the paths and know when to rebuild the project. Build and run, and you’ll see that same compile error! Even though the two projects are now together, KnobShowcase still doesn’t get KnobControl. It’s like they’re sitting in the same room, but KnobShowcase can’t see the new framework. You’ll link the framework to the app’s target to fix this problem. First, expand the KnobControl project to see the Products folder, and then look for KnobControl.framework beneath it. This file is the output of the framework project that packages up the binary code, headers, resources and metadata. 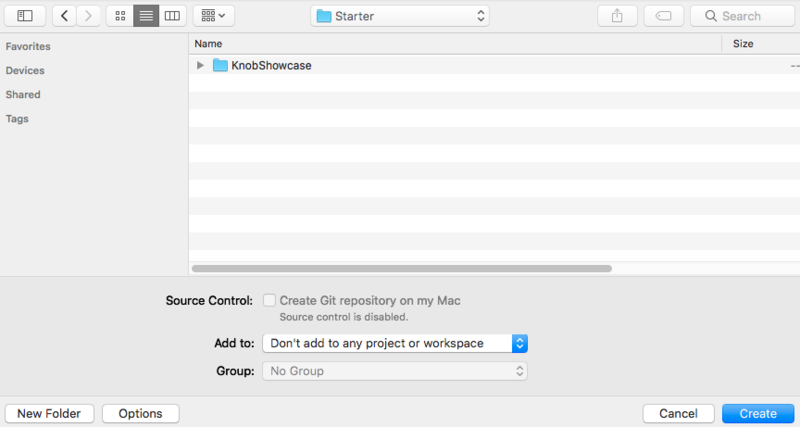 Select the top level KnobShowcase node to open the project editor. Click the KnobShowcase target, and then go to the General tab. Scroll down to the Embedded Binaries section. 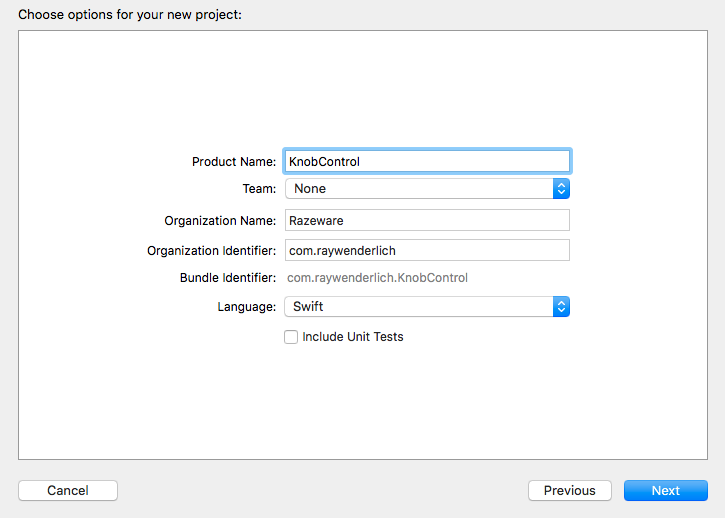 Drag KnobControl.framework from the Products folder of KnobControl.xcodeproj onto this section. You just added an entry for the framework in both Embedded Binaries and Linked Frameworks and Binaries. Now the app knows about the framework and where to find it, so that should be enough, right? Build KnobShowcase project. More of the same errors. Your problem is that although the framework is part of the project, the project’s code doesn’t know about it — out of sight, out of mind. Go to ViewController.swift, and add the following line to the list of imports at the top of the file. It’s critical, but this inclusion still won’t fix the build errors. This is because Swift uses access control to let you determine whether constructs are visible to other files or modules. By default, Swift makes everything internal or visible only within its own module. To restore functionality to the app, you have to update the access control on Knob class. Although it’s a bit tedious, the process of updating access control improves modularity by hiding code not meant to appear outside the framework. You do this by leaving certain functions with no access modifier, or by explicitly declaring them internal. Open and public: for code called by the app or other frameworks, e.g. a custom view. Internal: for code used between functions and classes within the framework, e.g. custom layers in that view. Fileprivate: for code used within a single file, e.g. a helper function that computes layout heights. Private: for code used within an enclosing declaration, such as a single class block, and extensions of that declaration in the same file. When Knob was part of the Showcase app, internal access wasn’t a problem. Now that it’s in a separate module, it must be made public for the app to use it. You’ll do that in the next section. Note: If you want to learn more about the internals of access control and to understand the difference between open and public, take a look at Access Control Documentation. Knob will now be visible to any app file that imports the KnobControl framework. startAngle, endAngle, pointerLength and color. Note for value, the property will be public while the setter continues to be private. The methods setValue(_:animated:) and tintColorDidChange(). Note: You might wonder why you have to declare init method as public. Apple explains this and other finer points of access control in their Access Control Documentation. Oh no! What’s going on? Go straight to the next section to fix the crash :]. When using storyboards, references to custom classes need to have both the class name and module set in the Identity inspector. At the time this storyboard was created, Knob was in the app’s module, but now it’s in the framework. Open Main.Storyboard in the KnobShowcase project. Select the Knob in the Document outline. 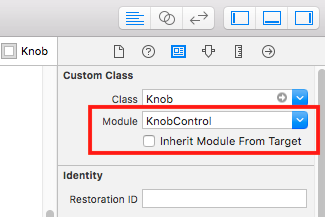 In the Identity inspector, under Custom Class, change the Module to KnobControl as shown below. Build and run. Now you should get your knob. Congratulations! You now have a working stand-alone framework and an app that uses it! One limitation of your framework is that you cannot customize the appearance of your custom control through Interface Builder (IB). Open Main.storyboard. You’ll notice a blank rectangle instead of the knob. If you are not seeing these blue boxes, turn on Editor ▸ Canvas ▸ Show Bounds Rectangles. In order to let users who import your framework change properties of the knob both programatically and visually, you need to rely on Live Views. Those are views which appear in IB as they will in the running app. This annotation instructs your project to enable live-rendering in IB. Open Main.storyboard and you’ll see nothing has changed. You still have a blank rectangle. Don’t worry! 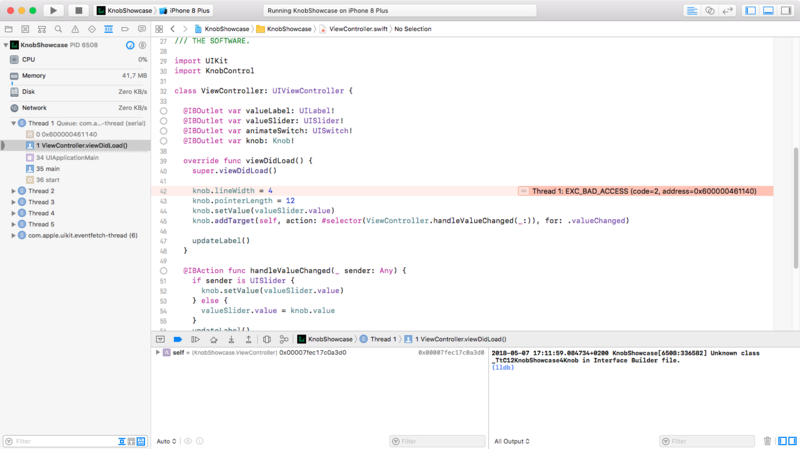 Apple provides a method, called prepareForInterfaceBuilder(), that is invoked only when rendering inside IB. Here you are setting the bounds of the knob in order to make it visible. Open Main.storyboard and make sure Editor ▸ Automatically Refresh Views is checked. 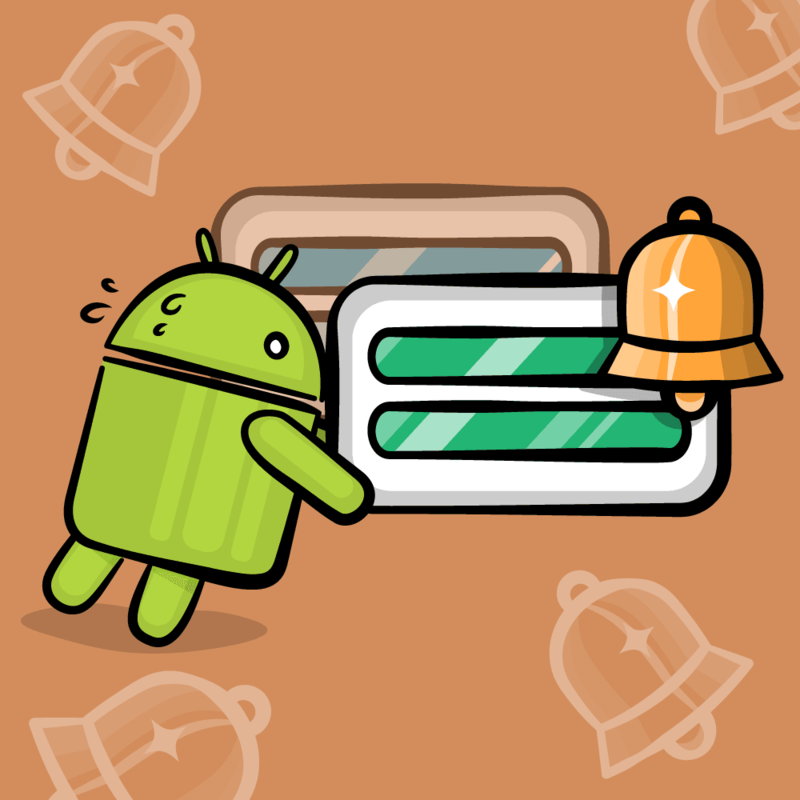 Now the blank rectangle has been replaced by the knob you see every time you run the app :]. It’s good being able to see the knob, but what if you want to configure the appearance for its properties, like the color, the line width or the pointer length? @IBInspectable comes to the rescue. If you annotate these properties, then IB will let you configure them in the attributes inspector. Open Knob.swift and put @IBInspectable in front of the following properties: lineWidth, pointerLength and color. Back in Main.storyboard select the knob control and view Attributes inspector. IB has created a new panel, titled Knob, showing the properties annotated with @IBInspectable. Play with those fields and you’ll see the shape or the color of the control changing live. Cool! CocoaPods is a popular dependency manager for iOS projects. It’s a tool for managing and versioning dependencies. 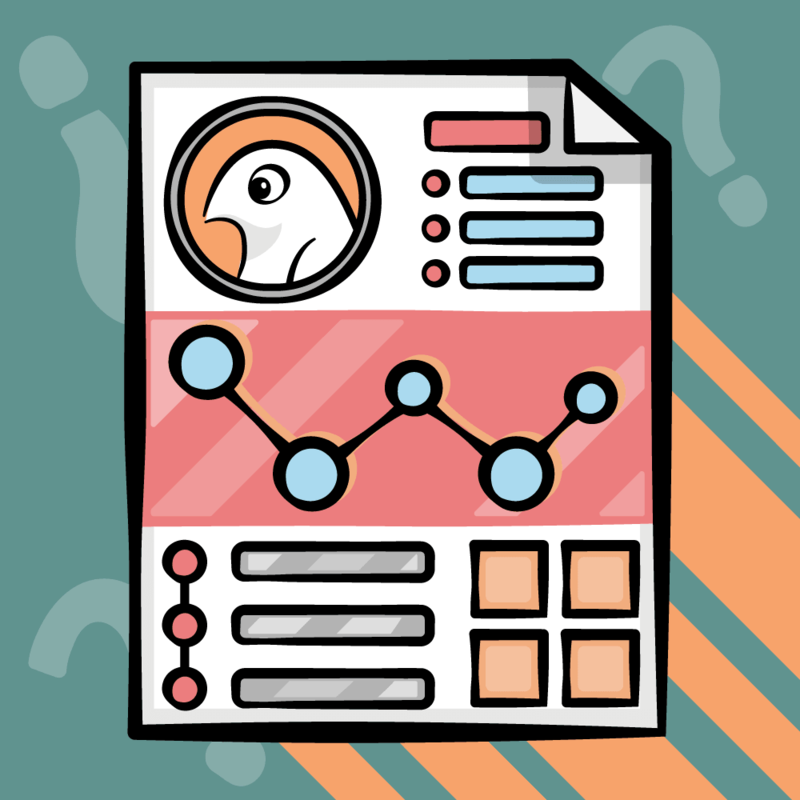 Similar to a framework, a CocoaPod, or pod for short, contains code and resources as well as metadata, dependencies, and setup for libraries. CocoaPods are built as frameworks that are included in the main app. Anyone can contribute libraries and frameworks to the public repository, which is open to other iOS app developers. Almost all of the popular third-party frameworks, such as Alamofire, Charts or RxSwift, distribute their code as a pod. Here’s why you should care: by making a framework into a pod, you give yourself a mechanism for distributing the code, resolving the dependencies, including and building the framework source, and easily sharing it with your organization or the wider development community. If you’ve been following along, you’re good to proceed to the next section and create a CocoaPod. If you’re just jumping in, or having trouble, the downloaded material for this tutorial contains an Intermediate version of the project up to this stage. Perform the following steps to remove the current link to KnobControl project from KnobShowcase. Select KnobControl.xcodeproj in the project navigator and delete it. Choose Remove Reference in the confirmation dialog, since you’ll need to keep the files on disk to create the pod. If you’ve never used CocoaPods before, you’ll need to follow a brief installation process before going any further. Go to the CocoaPods Installation Guide and come back here when you’re finished. Don’t worry, we’ll wait! Open Terminal and use cd to switch to the KnobControl root directory. This creates the file KnobControl.podspec in the current directory. It’s a template that describes the pod and how to build it. Open it in your preferred text editor. The template contains plenty of comment descriptions and suggestions for the commonly used settings. s.summary      = "A knob control like the UISlider, but in a circular form." 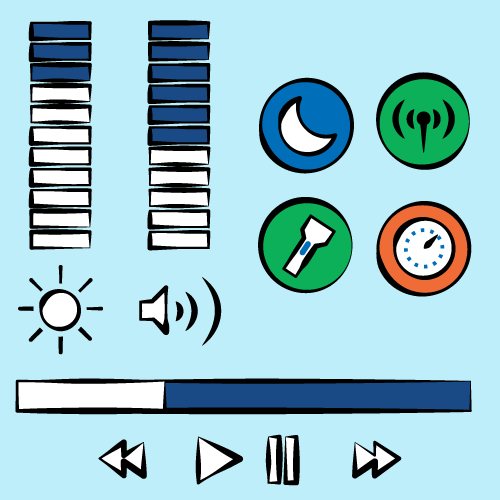 s.description  = "The knob control is a completely customizable widget that can be used in any iOS app. It also plays a little victory fanfare." Normally, the description would be a little more descriptive, and the homepage would point to a project page for the framework. You can keep the Author Metadata section as is, or set it with how you’d like to be credited and contacted. Replace the Source Location with the below code. When you’re ready to share the pod, this will be a link to the GitHub repository and the commit tag for this version. Add the following line above the one with end. This line helps the application project understand that this pod’s code was written for Swift 4.2. Remove all the comments — the lines that start with #. You now have a workable development Podspec. Note: If you run pod spec lint to verify the Podspec in Terminal, it’ll show an error because the source was not set to a valid URL. If you push the project to GitHub and fix that link, it will pass. However, having the linter pass is not necessary for local pod development. The Publish the Pod section below covers this. At this point, you’ve got a pod ready to rock and roll. Test it out by implementing it in the KnobShowcase app. This steathily creates a new file named Podfile that lists all pods that the app uses, along with their versions and optional configuration information. With this command, you’re searching the CocoaPods repository and downloading any new or updated pods that match the Podfile criteria. It also resolves any dependencies, updates the Xcode project files so it knows how to build and link the pods, and performs any other required configuration. Finally, it creates a KnobShowcase.xcworkspace file. Use this file to open the project from now on as it has references to both the app and any Pods. Close the KnobShowcase and KnobControl projects if they are open, and then open KnobShowcase.xcworkspace. To fix them, select the KnobShowcase root node and then the KnobShowcase target. 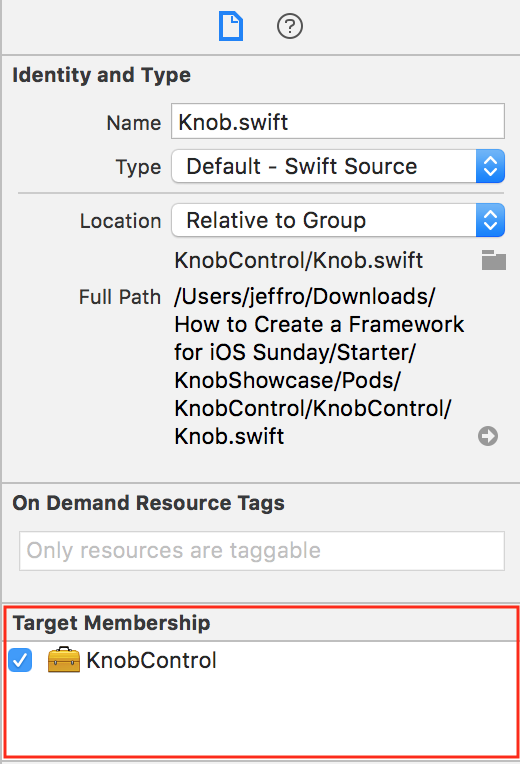 Switch to the Build Settings tab and in the search field look for ALWAYS_EMBED_SWIFT_STANDARD_LIBRARIES. Click on the pop-up for that build setting and select Other…. In the dialog replace the content with $(inherited). Run pod install again. Now the warnings should disappear! 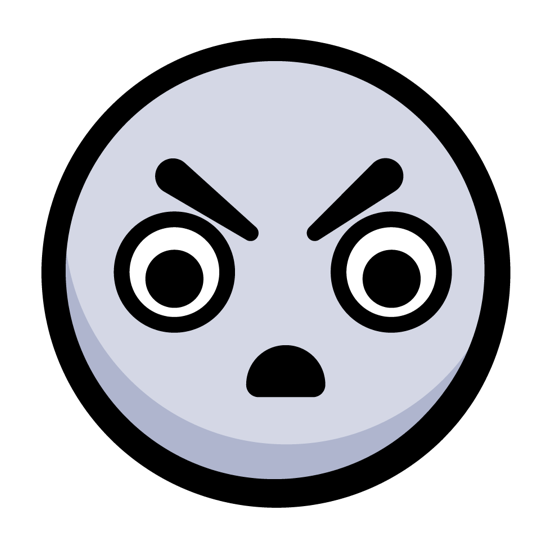 KnobControl was already a framework and you were already importing it. CocoaPods does the heavy lifting of building and packaging the framework; it also takes care of all the business around embedding and linking. Pods-KnobShowcase: a pod project builds all the individual pods as their own framework, and then combines them into one single framework: Pods-KnobShowcase. KnobControl: this replicates the same framework logic used for building it on its own. Inside the project organizer, you’ll see several groups. KnobControl is under Development Pods. This is a development pod because you defined the pod with a :path link in the app’s Podfile. You can edit and develop this code side-by-side with the main app code. Pods that come from a repository appear in a Pods directory and are listed in a Pods group. Any modifications you make are not pushed to the repository and are overwritten whenever you update the pods. Hooray! You’ve now created and deployed a CocoaPod — and you’re probably thinking about what to pack into a pod first. You’re welcome to stop here, congratulate yourself and move on to Where to Go From Here. But if you do, you’ll miss out on learning how to publish a pod where others can use it! This section walks you through publishing your pod to GitHub and using it like a third party framework. If you don’t already have a GitHub account, create one. 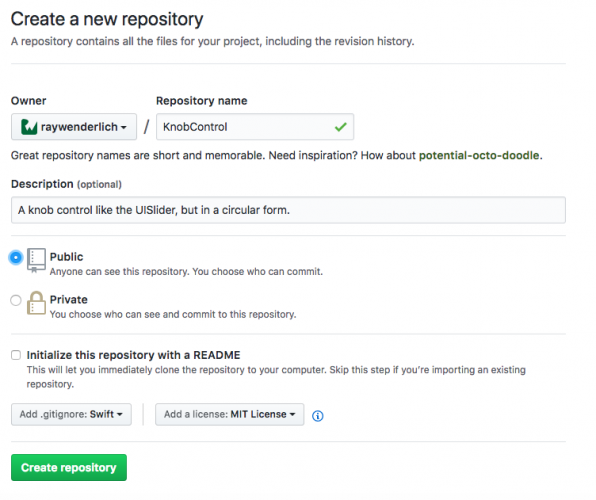 Now create a new repository to host the pod. KnobControl is the obvious best fit for the name, but you can name it whatever you want. Select Swift as the .gitignore language and MIT as the license. Click Create repository. On the dashboard page that follows, click Clone or download and copy the HTTPS link. This will be the URL value that you are going to use in the following sections. From there, clone the GitHub repository. Replace URL below with the HTTPS link from the GitHub page. Next, copy the contents of the root KnobControl directory to the repo/KnobControl directory. Replacing URL with the link to your repository. Now it gets real. In this step, you’ll commit and push the code to GitHub. Your little pod is about to enter the big kid’s pool. Run the following commands in Terminal to commit those files to the repository and push them back to the server. Visit the GitHub page and refresh it to see all the files. The response you’re looking for is KnobControl.podspec passed validation. 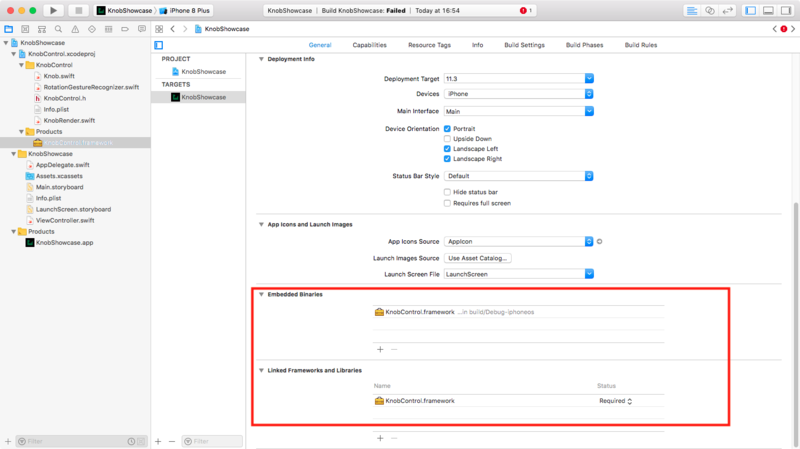 Note: If you get an error complaining that the iOS 12 simulator is not available, you need to make Xcode 10 your default Xcode using sudo xcode-select -p path-to-your-Xcode-10. Replace URL with your GitHub link and save when done. This tells KnobShowcase to use your published pod. Now the code will pull the framework from the GitHub repository, and it is no longer be a development pod! 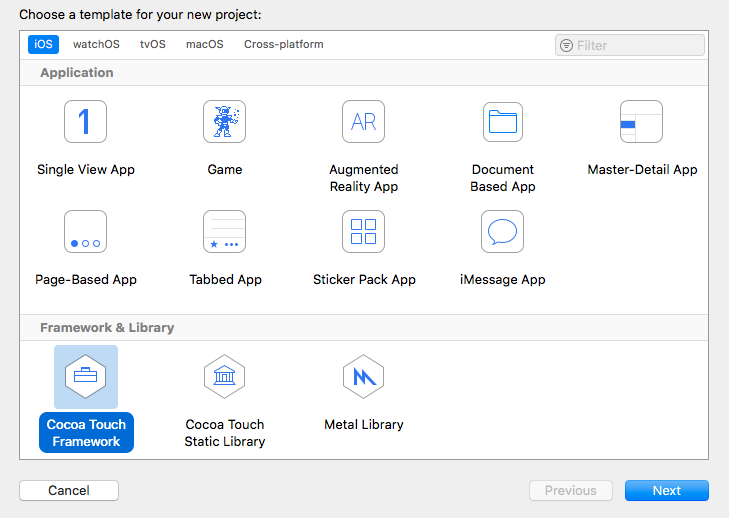 In this iOS frameworks tutorial, you made a framework from scratch, imported it into your app, and even turned it into a CocoaPod. Nice work! You can download the final project using the button at the top or bottom of the tutorial. 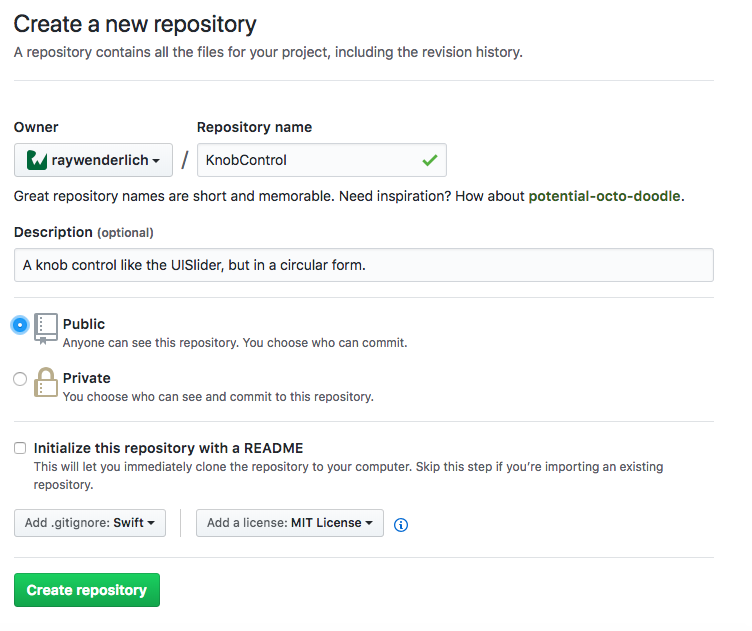 It doesn’t include the published CocoaPod, as the steps to set up a GitHub repository depend on your personal account information. Hats off to Sam Davies for developing the knob control. You might remember him from such videos as Introducing Custom Controls, where you can learn more about custom controls and custom frameworks. Spend some time at CocoaPods.org and be sure to check out how to submit to the public pod repository and the dozens of configuration flags. What did you learn from this? Any lingering questions? Want to share something that happened along the way? Let’s talk about it in the forums. See you there!